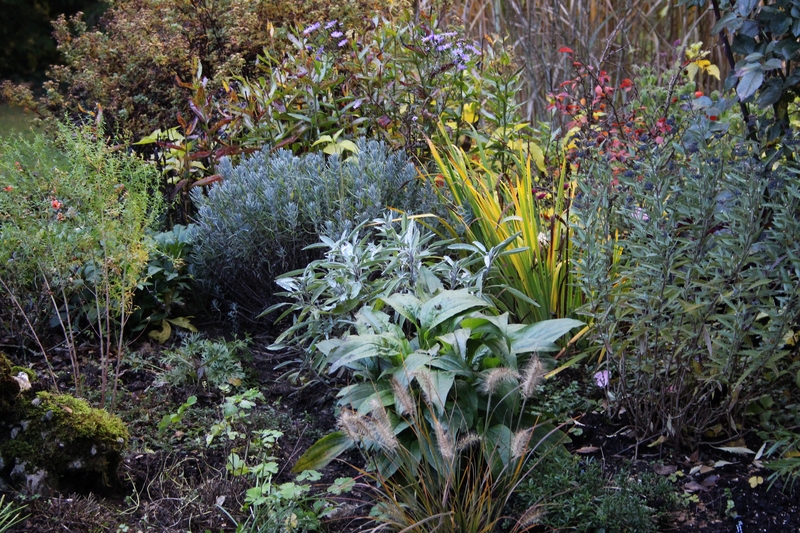 Cutting back perennials and shrubs in autumn is always a dilemma here, as for many of you I’m sure…. 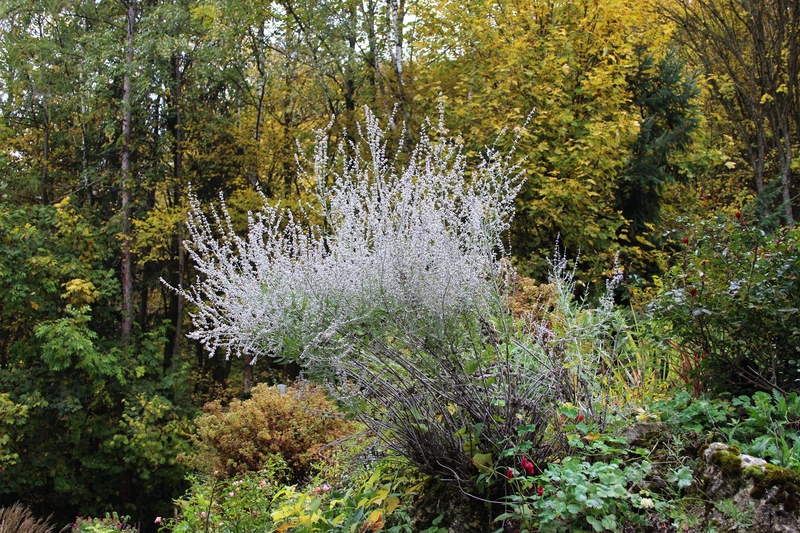 Should I wait until a frost catches me unawares and many plants simply collapse? Should I leave it all standing for the damp autumn valley mists to turn it all to a gooey slimey mess? Or should I cut back everything before it is really over, and forfeit a few blooms? After all, the debris all remains in the garden either chopped up as mulch or on our large compost heap. I usually opt for the latter option as it is quicker and easier as well as more pleasant to work when it is dry and when I have time, rather than wait until the weather turns really awful and the late afternoon daylight has vanished. So over the last week or so I have started trimming and snipping. There was brief interlude one day when I disturbed an exposed hedgehog nest – what was he thinking – half buried in the open rockery, albeit well wrapped up in a net of long grasses and leaves? We removed him carefully (luckily he seemed to be fast asleep already) and found a sheltered spot in the compost heap with some fresh hay. Then I returned to work and found myself taking pleasure in all the autumn scents around me. The Lysimachia is still emitting its bitter odour, but the Achillea’s distinctive scent has all but gone. Then there is the faded lavender, mmmmm, breathe in those deep herby undertones! Snip, snip…. Then the smell of woodsmoke wafts across the garden reminding me it will soon be Halloween and Guy Fawke’s Night. 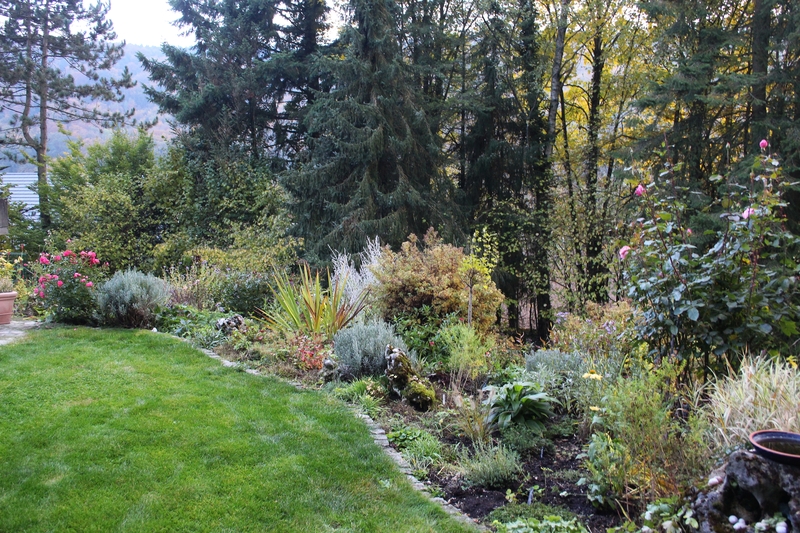 I spread some compost onto an area with a few new plants and catch a whiff of that musty earthy smell – rich soil that was not so long ago green stems and vegetable matter. Finally I mow the small lawn near the house – it barely smells of anything, no longer producing that rush of pleasure I feel at the scent of it in April or May. Do you try and get the chores done before it freezes? What’s your favourite scent of autumn? This entry was posted in Garden, Herbs & Spices, Nature, Plants, Wildlife and tagged Animals/Creatures, Autumn, Garden, Plants, Seasons. Bookmark the permalink. ← In a Vase on Monday: Fancy a Cuppa? I like the earthy, mushroom like scent in autumn. It really marks the season for me and yes, we are not far from Halloween and the 5th of November. Then, ding ding, Christmas is coming. Different aromas to look forward to. You are so disciplined and probaly right to get on which with cutting back the foliage while it is still dry. My favourite smell – peat smoke from the crofts on a late afternoon, telling me it is time to go home and light the fire. That sounds good Chris, although I am not sure what peat smoke smells like I assume it is a pleasant smell! The cutting back is an ongoing process anyway, so at least I have got started and most of it is done. Smells are difficult to describe, but burning peat has a much sweeter softer smell than wood. I am usually almost done before the first freeze but not this year…I am barely started at the end of October and will get little done this year. I leave up lots for the birds and let the beds be covered in leaves and debris for overwintering insects. I love the smell of the decaying leaves in fall. There have been years where I just haven’t had the time to get tidied up and then we have been surprised by early snow. It’s just messier in the spring though, and doesn’t do any harm! That is it Amelia…. at the moment it is lovely outdoors, but in a week it could be much colder and damp, which I hate when working outside. Hope your warm spell continues! I could almost smell those scents along with you, Cathy. What a lovely piece of writing. I like the damp smell of autumn in general, that early decay of falling leaves and the moisture that (finally) arrives on the air. Like you, I tend to jump in and prune away, sometimes leaving one or two blooms on the plant, but mostly taking things back to the ground for a hard prune, or to buds for next year as I do with the hydrangeas. We rarely get frost here, so for us it’s more a question of beating the rains which have been few and far between in recent years. I’m excited to see what the El Nino brings and hope its moderate, steady rain and not an all at once downpour. It makes me feel better knowing I am a little ahead on my chores, and I managed to put in the last of my spring bulbs yesterday too which always gives me a sense of relief that most of the work is done! I was just looking at my bulbs today, but lack the energy to get them in the ground. I’ll try again tomorrow. Luckily our narcissus remain in the ground year round, so I’ll have their reliable sunny faces to look forward to in February. I love the comforting smell of Autumn too and the photograph of the small lawn near your house, thats an area I have not seen before. Loved the anecdote too about your hibernating Hedgehog, I hope you are rewarded with more Hedgehog babies in the spring. Last year we had lots of hedgehog babies in the autumn, but no idea how many survived. I just hope this little fellow isn’t too disoriented when he wakes up! LOL! And you too Uta! Only a few October days left now. 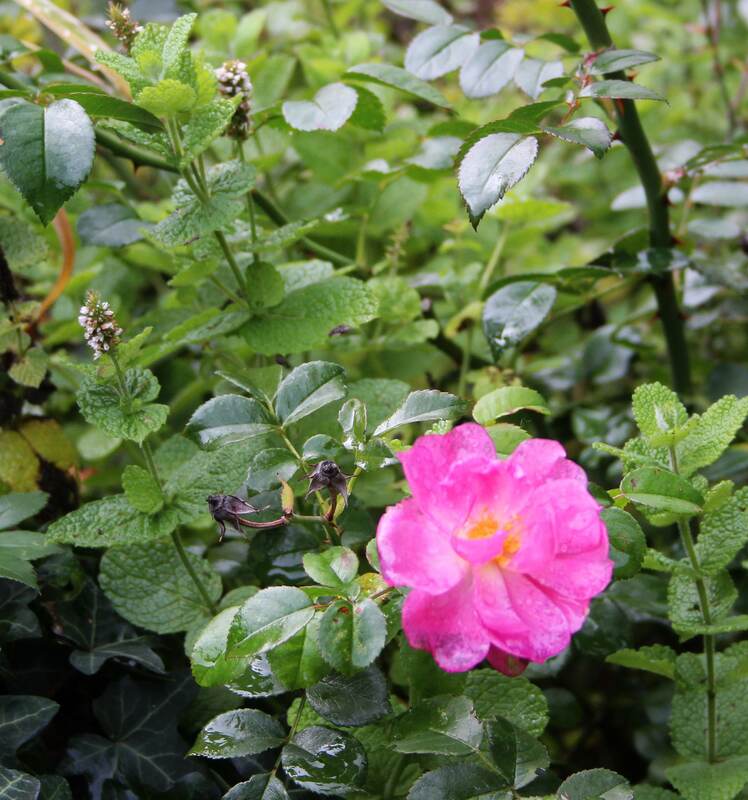 I love the smells of outdoors too – not just the sweet floral smells, but the bitter earthy ones as well. Your autumn garden is lovely. I enjoyed your descriptions of scent as you worked along. I don’t cut things back until they are really gone, usually Nov. or even early Dec. But I do have to get to the pond soon to drain it, return any frogs to the river bed and cover it for winter. Tomorrow is supposed to be sunny, a good day for it. I did get the pond done, but it took most of the day. Returned 7 frogs to the river (they die if left in our little pond) so worth all the effort. 🙂 Glad to have it off the to-do list! Yes, some of the autumn jobs are like that… I got my last bulbs in on Monday and was glad of that! Wood smoke, especially if apple wood is on the wood burner. I imagine it could be a little dangerous to work along side you at this time of year with all that snip snipping! A lovely evocative post. We’ve been cutting back overgrown bay bushes in the garden and the smell is amazing. Oh I bet that does smell good. I like the smell of the Thyme when I chop it back too. Thanks Sam! I enjoyed reading this post Cathy. I’m not sure what the smell is that me thinks that autumn is definitely here. I’ve not not smelt it yet this year but no doubt will do before long. I have always associated certain smells with autumn, although woodsmoke seems to be in the air for most of the year in our region. I hope you get a whiff of something nice and autumny soon Anna! We also have plenty of mint left in the garden which makes a very good infusion. I am always worried the snow will beat me to it and flatten everything to a mushy mess! I shall try and tie up my Miscanthus and protect by box shrubs this year, but a lot needs pruning back still. Yes, I like to use the mint for tea as well. 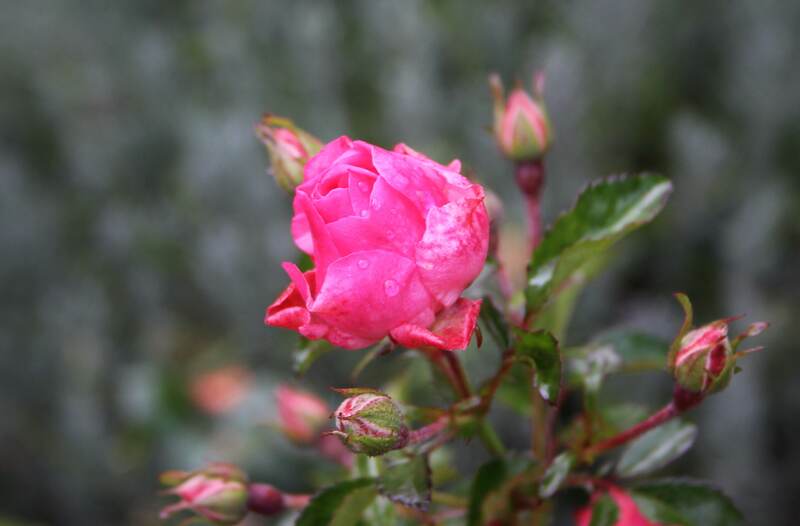 this is such a nice post Cathy, evoking scents and scenes of past times in the garden. I’ve let my cleanup go this year–still time for me to wake up and become conscientious though! 🙂 I walked around today and realised I still have quite a bit to do Susie, but I think I have a little time to finish off too. You have been busy. The Balkan geranium reminds me of gin and tonic. One of the things I most love about Autumn is the smell in the air, a mix of woodsmoke and gently decaying leaves I think, together with that slight snap that says winter is coming. When to tidy up is always an issue, isn’t it. I have resigned myself to it being unlikely that I have any hoar frosts to enjoy on standing plant seedheads, but I still only trim back the things that just always look ugly and mushy. Mind you, I have bulbs to plant yet, and some new plants to get in the ground while it is still warm! I got my last bulbs planted on Monday, and put the last new plant in for this year too, but still a great deal of tidying to do! My favourite autumn smell is roast chestnuts. I like the scents of geranium foliage except for the weedy one Herb Robert. Oh yes, roast chestnuts do smell good. I always associate that smell with the Christmas markets here though. And I agree regardingHerb Robert -it is just plain smelly! 😉 Thanks for visiting Susan! Yes, when I manage to get everything done by early November we don’t get snow, but guaranteed I’m behind schedule and I get caught out…. 😉 And then it’s difficult to get in the rockery as it is very slippery and hazardous!